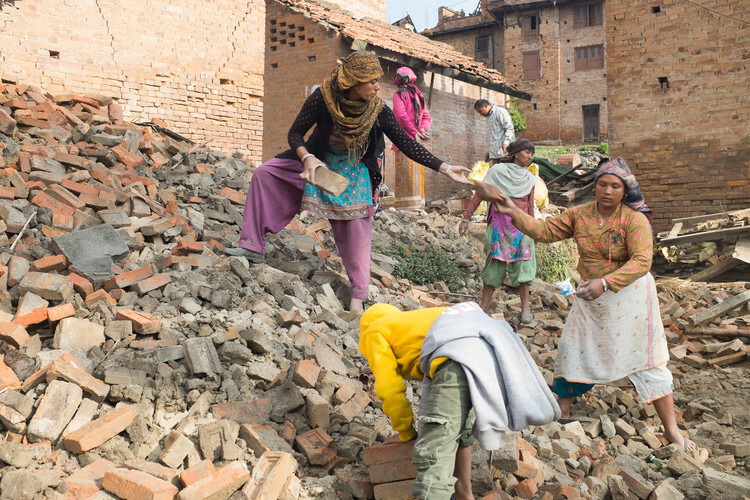 Following the earthquake in Nepal, psychologist Alessandra Pigni recalls her experiences in humanitarian aid: she reminds Western do-gooders that affected populations are resilient and that pathologising suffering after a traumatic event may get in the way of healing and recovery. There has been an understandable outpouring of sympathy in response to the powerfully destructive earthquake in Nepal. Appeals have been launched, aid is being distributed and assessments made for longer-term recovery. And, in the midst of it all, is the all too familiar call for psychological support for affected communities. The World Health Organization estimates that between five and 10 percent of people impacted by humanitarian emergencies suffer from a mental health condition as a result. I am reluctant to medicalise suffering in the aftermath of a natural disaster: symptoms of distress are a normal reaction to an abnormal situation and labelling does not help at an early stage. Of course, after a disaster strikes, everyone is in distress. But that doesn’t mean everybody needs to see a mental health practitioner. Back in 2010, a humanitarian agency asked me to go to Haiti following the devastating earthquake there. They (the NGO not the Haitians) needed psychologists. Having been to Haiti a decade earlier, I would have loved to return. Yet, we know from research that in the aftermath of a natural disaster psychologists armed with “talking therapies” have little to contribute: survivors need to go through the natural grief process and the vast majority will not develop post-traumatic stress disorder (PTSD), nor any other psychological disorder. Social support and time will heal psychological wounds. I feared Haiti would be inappropriately invaded by grief counsellors, so I decided to stay at home. In the same year an earthquake also struck Yushu on the Tibetan Plateau. I had visited the area in 2009 so knew a little of the place and its people. I called the local representative of an aid agency. "I don't think it's a good idea to send psychologists," I said. Sure enough, he replied: "We must help, we have to do something." A therapist with years of field experience duly carried out an assessment and found that the deeply Buddhist Yushu community did not need our psychologists. Her report was ignored. The agency sent Western counsellors. I was in Sichuan following the 2008 earthquake and a Chinese colleague told me that many of those who survived the natural disaster spoke with contempt of Western psychosocial programmes. What people feared most after the earthquake were "theft, fire and psychologists," she said. And I'm not sure it was necessarily in that order. I tried to use that lesson when an earthquake hit the region of Abruzzo in Italy in 2009, advising the psychosocial manager of an NGO to try recruiting Chinese counsellors. Predictably, he didn't think that was appropriate. But why not? If an Italian psychologist, in this case me, can fly off to China to provide therapy, why not the other way round? The neocolonial mentality is sometimes so engrained in parts of the aid sector that we fail to notice our paternalism: "we" can help "them," but it never occurs to us that "they" may be able to help "us"? My presence in Sichuan was as appropriate as the presence of a Chinese psychologist would have been in Abruzzo. What I'm about to say may sound selfish to the naive and zealous ear. I'll say it anyway: please let's not rush in with well-meaning psychosocial programmes. Especially, let us avoid flooding Nepal with Western-style “talking therapies” delivered via translators. People are resilient and will process their grief in ways that work within their own worldview, with their own traditions and rituals and understanding of death and (re)birth and human suffering. You can’t give people peace of mind if they don’t have a home. If agencies insist there is a need to send additional support for mental health programmes, they should at least ensure they refer to Inter-Agency Standing Committee (IASC) guidelines, with the principle of “doing no harm” at their core. The guidelines provide some valid good practice: the “dos and don'ts," if you like. Mostly what needs to be encouraged is "humane, supportive and practical help to fellow human beings suffering serious crisis events" as prescribed by the principles of Psychological First Aid (PFA). It mostly boils down to common sense. Psychological healing goes hand in hand with physical reconstruction. You can’t give people peace of mind if they don’t have a home. Let's help where needed, but let's not get in the way of people's healing process. We need to put our ego and our desire to “be there” aside and, for once, do things differently. Nepal's natural disaster is not an opportunity for voluntourism, or an escape from personal problems, or a way to fill up the void in your life. And that applies as much to improvised do-gooders as to humanitarian professionals whose presence may not be essential. Sometimes the best way to do no harm is not to intervene. Instead of sending grief counsellors to Nepal, let's make sure that the staff – international and local – who are working to bring the vital physical aid to severely affected communities get the support and care they need to be able to do the job. Otherwise they will be the ones in need a psychologist when they return home. Kunda Dixit, rédacteur en chef de l’hebdomadaire réputé Nepali Times, ne travaillait pas l’après-midi du 25 avril. Il avait profité de ce samedi pour aller randonner dans les montagnes qui surplombent Katmandou avec quelques collègues.